Legislators are expected to vote for J.B. Pritzker’s progressive income tax plan by the time the session ends in May. And you can expect the capital bill and budget to be approved at the same time, too. The constitutional change to secure the progressive income tax is expected to be introduced in the state Senate by next week for a first reading. The message to lawmakers is that the capital bill won’t be possible without supporting the progressive income tax. “If we can’t put ourselves on a path to balance the budget, we can’t ask people to support the taxes necessary to fund a capital bill,” a Dem leader told POLITICO. Funding the capital bill would likely include a gas tax and license-plate fees. House Speaker Mike Madigan, meanwhile, has been meeting individually with lawmakers over dinner at Saputo’s to hear their thoughts on the session. During those one-on-one conversations, members are telling him “things are moving too fast,” according to another Democrat. That explains how state Rep. Marty Moylan secured 60 signatures on a bill that calls for more study into recreational marijuana—another revenue generator proposed by Pritzker. Slowing down or rejecting a revenue proposal has consequences. During a recent Democratic Caucus meeting, lawmakers were told that they’ve got to come up with areas in the budget to cut if Pritzker’s menu of revenue generators aren’t met. After going through that exercise, it’s expected the progressive income tax might be more appealing after all. Ald. Carrie Austin wants to make one thing clear. She’s just fine with Mayor Lori Lightfoot moving in to the Fifth Floor of City Hall. The powerful alderman just doesn’t like Lightfoot’s marquee message—getting rid of aldermanic prerogative. Austin (34th) says her opposition to the idea doesn’t mean she’s organizing against Lightfoot. “I’m not,” she told POLITICO. But Austin, who oversees the Committee on Budget and Government Operations, has been outspoken on the issue, saying it’s essential to her ability to govern. She’s made that loud and clear to aldermen and media alike. At least a few council members interpret that as Austin “advocating for a strong council against the mayor.” Austin says not exactly. “I believe in both being strong. However, we may not agree on every issue.” Austin opposes ending aldermanic prerogative “because that’s opposing my community. It opposes my residents.” Her ward covers portions of Morgan Park, Roseland, Washington Heights and West Pullman on the South Side. Austin also is the ward’s Democratic committeewoman. 43 community leaders agree: Granting Divvy a monopoly over the city’s bikeshare system is not in the best interest of Chicago. All companies that want to invest in our city should be allowed to do so. Read their letter here and visit https://pumpthebrakeschicago.com for more information. Gov. J.B. Pritzker and first lady of Illinois M.K. Pritzker hosted their first Passover Seder at the governor’s mansion last night. Other governors have held Seders in the mansion but he’s the first Jewish governor to do so. About a hundred people attended—Jewish lawmakers, gubernatorial employees, rabbis from around the state and plenty of friends. The service was led by Seth Limmer, the Pritzkers’ rabbi from Temple Sinai. A fun moment in the evening saw rabbis break out into song as violinist Allison Zabelin played—she’s a cousin to state Rep. Sara Feigenholtz, who also attended. Other notables: Lt. Gov. Juliana Stratton, Deputy Gov. Jesse Ruiz and his wife, attorney Michelle Ruiz; Consul General of Israel to the Midwest Aviv Ezra; Holocaust survivor and chair of the board of the Illinois Holocaust Museum Fritzie Fritzshall; state Rep. Robyn Gabel, state Rep. Yehiel Kalish, state Rep. Bob Morgan, state Sen. Julie Morrison and state Sen. Ram Villivalam. The food was kosher and catered by Zelda’s in Skokie. The matzah ball soup was described as “delicious” by one guest and “fluffy” by another. Petitioner for special prosecutor in Jussie Smollett case wants judge from outside Cook County to decide: Retired state appellate judge Sheila O’Brien, who’s calling for a special prosecutor to probe Cook County State’s Attorney Kim Foxx’s handling of the Jussie Smollett case, argued in a court filing Monday that any judge in Cook County would have a conflict of interest if Foxx is called as a witness. Tribune’s Megan Crepeau has the story here. — It was pure theater in City Hall yesterday when Mayor Rahm Emanuel acquiesced to Mayor-elect Lori Lightfoot and asked the Finance Committee to hold off on voting on Lincoln Yards and The 78 development projects. The activists who helped elect Lightfoot cheered upon hearing the news. But Ald. Brian Hopkins (2nd), whose ward includes the 55-acre Lincoln Yards site, shot back. He told reporters: “The mayor doesn’t sit on the Finance Committee.” He called on the committee to vote anyway. All eyes shifted to lame-duck Ald. Pat O’Connor, who heads Finance. An Emanuel ally to the end, he pushed the pause button, saying the vote would take place Wednesday to give Emanuel and Lightfoot a chance to figure out how to “move forward.” Given aldermen have already voted in favor of the projects, minds aren’t likely to be changed. But there could be maneuvering that allows Lightfoot to get a little more out of the deal for the sake of her supporters. Sun-Times’ Fran Spielman has more details here. And here’s the Tribune’s take by John Byrne. — Fair work week on hold. Some parliamentary maneuvering put the fair workweek proposal on hold yesterday. It was up for a vote in the Committee on Workforce Development and Audit. But it was 4:45 p.m. by the time Ald. Pat O’Connor (40th) arrived to the meeting. He called for a vote and then Ald. Tom Tunney (44th) called for a quorum. By that hour, they didn’t have it. So O’Connor adjourned the meeting. That means the issue will be taken up by the new city council after the May 20 inauguration. — City Council committee OKs Lyft bike-share deal to expand Divvy citywide by 2021: Lyft is one step closer to becoming the exclusive operator of Chicago’s Divvy bike-share program after the city council’s Traffic Committee approved the deal on a voice vote Monday, shrugging off rival Uber’s objections. Lightfoot has sharply criticized the process by which Emanuel negotiated the deal, saying it lacked proper vetting and transparency. Sun-Times’ Fran Spielman has the story here. — A rapidly spreading, potentially deadly fungus is spreading across the city. Tribune’s Robert McCoppin has details here. A tavern on (almost) every corner: Why do so many Chicago bars disappear? WBEZ’s Jake Smith explains. Curious City story here. — Poor left, rich thrived when Illinois hiked flat tax: When Illinois’ flat tax rates leapt a record 67 percent a few years back, wealthy job creators stayed put despite fears they’d flee the state. That’s according to a Better Government Association analysis of federal data, which also found the tax hike coincided with a significant drop in low- and modest-income taxpayers. BGA’s Tim Jones and Bob Secter have the story here. — Julie Morita joins Robert Wood Johnson Foundation as executive vice president. Morita, the current commissioner of the Chicago Department of Public Health, will oversee the foundation’s programming, policy, research and communications. More. Morita appeared on POLITICO’s "Pulse Check" podcast in 2017. — Mary Werden has left the office of U.S. Rep. Bill Foster to work as comms director for U.S. Rep. Frank Pallone (D-N.J.). — Judith Gethner will retire from Illinois Partners for Human Service in June. Gethner has led the organization as founding executive director. She’s staying on while the board of directors conducts a search for a new executive director. Illinois Partners is an umbrella group for human service organizations. Cook County State’s Attorney Kim Foxx celebrates today. Belated well wishes to former state GOP Chair Pat Brady, who heads Next Generation Strategies, and Niles Mayor Andrew Przybylo. They both celebrated yesterday. At the Aon Center to celebrate the new KPMG Chicago Ignition Center and then attending a meeting of the Public Building Commission. In D.C. to speak at North America’s Building Trades Unions’ 2019 Legislative Conference in the morning. Then back to Springfield the Illinois Council on Women and Girls gathering. 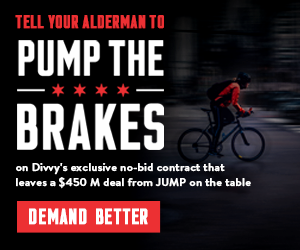 43 community leaders have written to all 50 aldermen urging them to PUMP THE BRAKES on a deal that would give Divvy a monopoly over our city’s bikeshare program, preventing other companies from investing in Chicago. This deal would disproportionately impact the South and West sides, blocking other bikeshare companies from bringing bikes, jobs, and investment into these communities. JUMP has offered the city a deal that would invest $450 million, create 500 jobs, and bring bikes to all 50 wards in 2019. Despite this offer, the City Council is rushing to approve a deal with Divvy—one that only invests $50 million in our city, creates only 200 jobs, and doesn’t fully expand bikeshare access until 2021. 43 community leaders are clear: let’s do both. Chicago is best served when all companies that want to invest in our city are allowed to do so. Read their letter here.